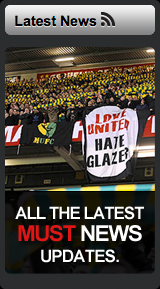 A very popular badge encapsulating the succinct message of the Green & Gold protests, "GO - Glazers Out". This small top quality enamel pin badge (about 2.5 cm) tells it like it is with GO in Green & Gold in the centre and 'GLAZERS OUT' text around the edge. This badge was very popular when sold from our match day stalls and is sure to sell out fast so get yours now. If you wish to donate to MUST to help finance the Green & Gold Campaign please go here. All profits from the sale of these items will go towards the MUST Green & Gold Campaign.